Miller Canvas is an authorized Ozroll Distributor for genuine Ozroll Ozroll Roller Shutters. 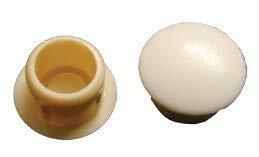 Side Guide 10 mm plastic hole cap. Select the colour as an option. Minimum quantity of 24 is sold. If you require more they are then added in multiples of 6. Delivery is via Express Post. Flat rate of $15.00 per order. Make sure you purchase genuine Ozroll replacement parts from Miller Canvas.